here we are manufacture and export this black galaxy granite counter tops in 3cm thickness in half, full moulding as per requirements. also available in other colors black granite, tan brown, steel grey etc. price is good and competitive. We are strongly backed by a smart logistics network owing to which we are capable to deliver the product range in safe and timely manner. Stay rest assured for the products that we offer as they will remain damage free. 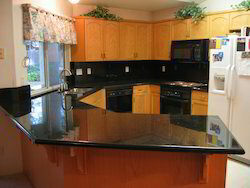 We offer our clients premium quality full bullnosed counter granite that is ideal for interior and exterior decors. Extensively used in flooring, facades and tabletops, these stones are known for their course grained and equigranular texture. our range of full bullnosed counter granite is available in the form of tiles and slabs of various dimensions. Being one of the renowned firms in the industry, we are decidedly involved in providing a high-quality array of Countertop Granite Stone.